Acute nephritic syndrome is a group of symptoms that occur with some disorders that cause swelling and inflammation of the glomeruli in the kidney, or glomerulonephritis. 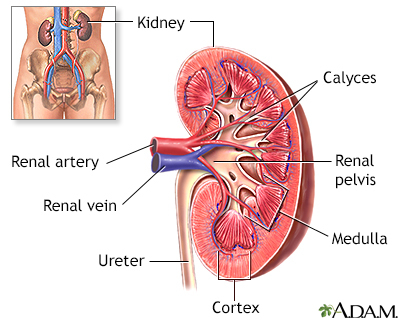 Acute nephritic syndrome is often caused by an immune response triggered by an infection or other disease. The inflammation affects the function of the glomerulus. This is the part of the kidney that filters blood to make urine and remove waste. As a result, blood and protein appear in the urine, and excess fluid builds up in the body. Swelling of the body occurs when the blood loses a protein called albumin. Albumin keeps fluid in the blood vessels. When it is lost, fluid collects in the body tissues. Blood loss from the damaged kidney structures leads to blood in the urine. Symptoms of acute kidney failure or long-term (chronic) kidney disease may develop. A kidney biopsy will show inflammation of the glomeruli, which may indicate the cause of the condition. The goal of treatment is to reduce inflammation in the kidney and control high blood pressure. You may need to stay in a hospital to be diagnosed and treated. The outlook depends on the disease that is causing the nephritis. When the condition improves, symptoms of fluid retention (such as swelling and cough) and high blood pressure may go away in 1 or 2 weeks. Urine tests may take months to return to normal. Children tend to do better than adults and usually recover completely. Only rarely do they develop complications or progress to chronic glomerulonephritis and chronic kidney disease. Adults do not recover as well or as quickly as children. Although it is unusual for the disease to return, in some adults, the disease does return and they will develop end-stage kidney disease and may need dialysis or a kidney transplant. Call your provider if you have symptoms of acute nephritic syndrome. Often, the disorder cannot be prevented, although treatment of illness and infection may help to reduce the risk.